WHERE Classic Stage Company, 136 E. 13th St.
BOTTOM LINE Pared down version enhances the sizzle in the famed opera, relocated to the deep South of World War II. Tobacco factory, parachute factory, no matter. The hotblooded femme fatale Carmen would smolder in an ice cream shop. 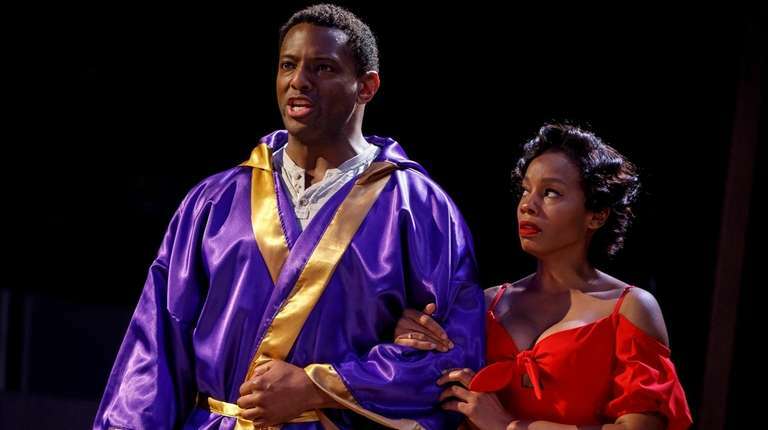 And in "Carmen Jones," Oscar Hammerstein II's take on the Bizet opera getting its first major New York revival at Classic Stage Company since it opened some 75 years ago, Tony winner Anika Noni Rose sizzles with a vibrancy that shakes your very core. Hammerstein created the work specifically for a cast of close to 100 black actors, somewhat earthshaking in 1943, and in 1954 Otto Preminger did a movie version starring Harry Belafonte and Dorothy Dandridge (becoming the first African-American to get an Oscar nomination as best actress). But today it's Classic Stage artistic director John Doyle who, with a pared-down cast of just 10 extraordinary actors, gives the rarely performed musical a new intensity, distilling it to the essentials — as is his style — for a 95-minute one act. Now set during World War II, Carmen is portrayed as a known troublemaker, fast to mouth off, even faster to lash out. But the basic story is the same, right down to the bloody ending. Instead of the Spanish soldier Don José, we get Joe (a poignant Clifton Duncan), an Air Force flyer who falls hard for Carmen; the bullfighter Escamillo becomes Husky Miller (the powerfully voiced David Aron Damane), a prizefighter who lures her to Chicago with the promise of riches she never imagined. You don't have to be an opera lover to recognize this music, so familiar from, among other things, movies like "Up" and "Aristocats," not to mention a Doritos commercial. But the colloquial vernacular of the black South can be jarring at times. Consider the famed "Toreador Song," which here becomes a battle cry for Husky — "Stan' up an' fight, until you hear de bell." Or Carmen's most recognizable entrance aria, now titled "Dat's Love," in which she laments "one man treats me like I was mud." Still, the strength of the story, combined with incredible vocals all around, is reason enough, as one of the songs suggests, to simply lose yourself in "de sweetness in de music."